Ethical Consumer and Lush Cosmetics launched the Lush Spring Prize on 5th December 2016. £400,000 has so far been awarded to projects around the world working on environmental and social regeneration. In the 1990’s, sustainability became a buzzword. A lot of amazing work has been done to develop systems that meet the needs of the present, without compromising the ability of future generations to meet their own needs. But many environments and societies are still degraded, and need more than sustaining – they need regenerating. The Prize hopes to increase access to resources, information and skills to build alternatives to the dominant culture of degeneration. We need to redesign economies and cultures, to make a fundamental shift to a regenerative culture. The Prize celebrates projects around the world that are increasing the capacity of communities and societies to thrive in harmony with nature and each other. Exploitation has gone too far. There are too many win / lose situations, where one goal is pursued at the expense of another. Where short-term gain undermines long-term survival; where the economy grows, but the environment is degraded, or where some people benefit from other people’s suffering. The whole system needs attention. Our own wellbeing relies on the health of natural and social systems and many inter-connected relationships. We are interdependent, and things could be better organised to benefit all. We need to move beyond the ‘sustainable’. The word ‘sustainable’ has been used a lot over the last 20 years to describe situations which prolong ‘business as usual’ and maintain inequalities. We need livelihoods that can revive and regenerate damaged environments and communities. We are looking for projects that are actively contributing to the health of all the systems they are part of. The Prize is funded by Lush Cosmetics, a campaigning company with over 850 shops spanning 51 countries. Lush have provided funding for regenerative projects through the SLush (sustainable Lush) Fund since 2010. The Prize is coordinated by Ethical Consumer, a non-profit multi-stakeholder co-operative in the UK. Ethical Consumer’s research and publishing supports consumer power to generate positive impacts for the environment, people, animals and society. 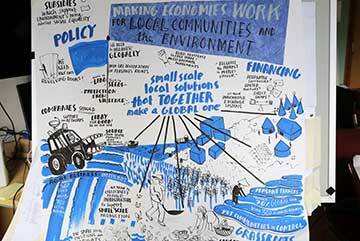 More than Minutes’ visual summary of the 2017 LUSH Spring Prize workshop ‘making economies work for local communities and the environment’.